“Observed Transcendence”, was a solo show curated by Victoria artist and curator Cornelia van Voorst. 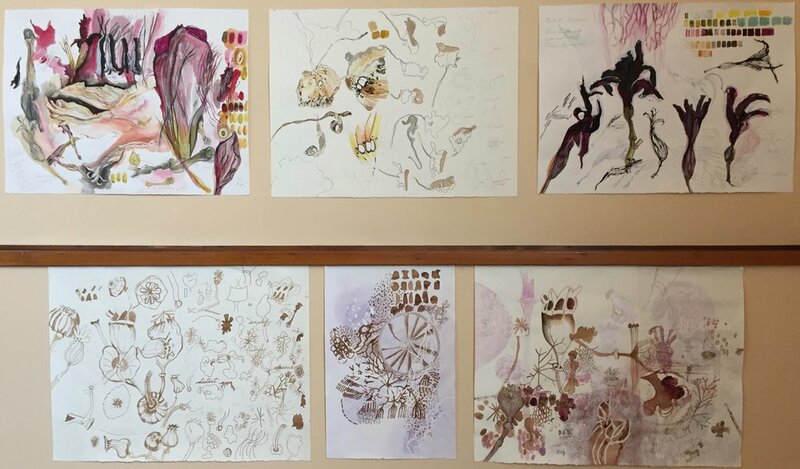 On display was a combination of my mixed media observational drawings and paintings of plant life in various cycles of growth and decay. As well there were a few of my pieces from the “Transformations”, “Bounty” and “Small Wonders” series. The Stairwell Gallery is a space devoted to the visual arts in St Philip Anglican Church. The gallery is open for viewing Monday to Friday 9am to noon and by appointment. The “sacred” includes all of life; art is a means of comprehending that sacredness. Art that is shown does not need to be specifically religious, it is a sincere response to life and our experience of being human. Art is also hosted in the church sanctuary which has high ceilings and tall walls-invaluable for large scale work. The building is simple, modernist and is graced by extraordinary stained glass. Read more about the art at the stairwell gallery blog and on facebook. The Stairwell Gallery is open Monday to Thursday. Call the office ahead @ 250-592-6823 to make sure it is open. “During July and August of 2017, Jill Ehlert presented six works from her Transformations series as two triptychs in the Sanctuary at St. Philip Anglican Church. The Small Wonders series was displayed in the Stairwell Gallery, along with a selection of botanical studies, and work from the Bounty series. Soon Jill Ehlert will be sharing her newest work. To look at, pay attention to, and observe in order to understand, is as much an act of love as listening. Jill Ehlert listens to nature by tracing the forms of natural objects with her eye, mind and heart. That attention is translated by hand to paper using graphite, pencil crayon, pen and ink, water colour, gouache and fluid acrylics. Through her abstractions we the viewers become involved with the intimate life of what we might otherwise think of as inanimate. 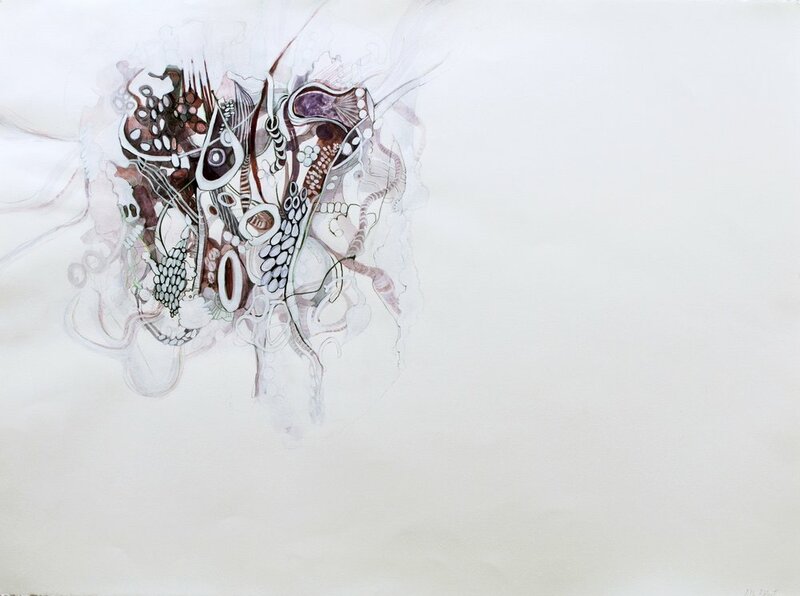 Acquainted through observation with the stages of the life cycle of plants, and translating those observations into art, Jill Ehlert’s work is a testimony to the fundamental rhythm of life to death, and death to life. Especially in the work of the Transformation series, a sense of integration and rhythm swoops and swirls, shimmers and sways as though describing a dance. Seen through her drawings, shrivelled plant material which might be considered something to discard takes on meaning. We are no longer looking at death, we are looking at evidence of life that Jill has drawn for us to follow into the wonder of transformation- a transformation from being in a state of separation and decay into one of integration and connection. This idea that death is not an ending but a beginning is central to sacred traditions from all around the world. The story of Christ dying to bring new life did not come out of a vacuum, it is a story deeply rooted in truths that are evident in nature if we would pay attention. By understanding the life cycle, we can understand the story of the crucifixion not as a need for God to satisfy wrath but a story about incorporating human reality, with its experience of suffering and death, being restored to the larger story of love and life. In fact Jesus describes his death as a seed falling to the ground and dying so that it might break open and release the life within. Western Christian understanding of the divine used to be informed by our attention to nature. It is only recently, that that attentiveness has been considered foreign to religion. It is no co-incidence that the earth is suffering thanks to a culture based on a religion that has become wary of, if not outright rejecting of the human disciplines of art and science; disciplines through which earlier Christian scientists and philosophers considered nature to be God’s second book. The two triptychs in the “Sanctuary” are part of a series titled "Transformations". In the Transformations series, I drew from objects existing in the natural and manufactured world as a means to direct the animated forms of my imagination. I combined dissimilar objects such as pomegranates, plankton, decorative curtain tassels, the inner ear and the mechanical structure of a potato masher. These forms were simplified into smaller components through a process of drawing, editing and refining. I intermixed these unlikely combinations, creating an invented language of organic shapes. Studies on the bulletin board show my ongoing interest in botanical studies, the structure and stages of plant life.